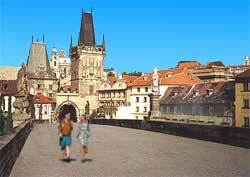 It is Prague's oldest (14th Century), best preserved and most beloved bridge - and has become a city icon and a world famous gathering spot. On fair weather middays, thousands of tourists, street musicians and artists, and souvenir hawkers pack the cobbled road from one end of Charles Bridge to the other. This creates a fun, carnival-like atmosphere. For a completely different ambiance, go when Charles Bridge is practically empty. Best times are in the early morning (when the mist glides down the river) and in the evening (when Prague Castle and other old edifices are romantically illuminated). Today, Charles Bridge is strictly for foot traffic. However, in the past, horses, carriages, trams and cars would cross the bridge.